In this article, suggestions are presented to help organisations prepare for the implementation of a CSR system and to ensure that the investment produces maximum rewards in terms of streamlined processes, real-time reporting and ideally decreased costs. Step 1 – How to prepare the Business Case? A CSR system, what for? The vast majority of companies today make their critical CSR decisions based on spreadsheets, home-grown applications or somewhat limited desktop applications. However, the more advanced and successful companies tend to implement a full-blown Enterprise CSR system to manage their organisation’s end-to-end processes. In an Enterprise CSR solution, these processes are integrated together and they access the same data from a central database. So what are the benefits of implementing a comprehensive CSR system? A CSR system manages a lot of data, and the more a company integrates the data driven by CSR policies and programs, the more benefits there are to be derived. A CSR solution will help a company to meet its social and environmental performance targets. An Enterprise CSR Solution will contribute to a company’s sustainability by providing managers with reports and Key Performance Indicators (KPI) that will help ensure and demonstrate transparency, and measure the efficiency and impact of their projects. CSR solutions also introduce “best practices”, which are practices that are found to be the best way to perform certain processes in the industry. One of the first steps essential to the preparation for the implementation of a CSR system is the development and presentation of a strong business case. When it comes to timing, companies need to make their move early. Managers need to read the signs that they are outgrowing their current systems and practices, and act before it is too late. Indeed, despite the cost of implementing an Enterprise CSR system, the cost of delaying it is likely to be higher. An Enterprise CSR system is often considered a strategic investment and the project may have tangible and intangible benefits. Other cost savings may be derived from less rework, quality assurance, document printing, etc. Statistics on the cost of these things are often readily available and can be used to put hard numbers into and consolidate a Business Case. How to select a CSR solution? The risk of selecting an unsuitable CSR solution is real. It is important to pay attention to the company’s processes and needs over the long-term, and to the features of the system. The decision must be based on what is known at the time and what can be predicted about the future. It is preferable to acquire the most optimal solution for the company’s need, rather than an inexpensive one. Money saved in the wrong areas, might later prove costly. Built-in best practices based on international norms and standards, such as IFC, Equator Principles, ISO, ICMM, IPIECA, GRI, etc. Whether the vendor provides CSR services in addition to the software, such as on-the-ground surveying and consulting. A proper system selection methodology includes a list of selection criteria. An organisation should have a clear vision of why it is embarking on such a project and what are the business objectives for it. The challenge is to smoothly change from the old way of doing things to the new system and practices. Step 2 – How to prepare the Scope? A high-level scope has most likely been established with the Business Case and now a scoping study may be performed in order to elicit the detailed scope for the project. Alternatively, the scoping study could come prior and the results used for the Business Case. In any case, a scoping study is strongly recommended to ensure the project delivers against the objectives and benefits, while maximising the strength of the selected solution. A detailed scope or high-level requirements will ideally be elicited up front in accordance with both the business objectives and end solution in mind. Implementing a CSR system is an opportunity to have a good hard look at the company’s CSR processes, and establish how they can be improved and supported by the system. The scoping phase serves to anchor the project priorities, helping to define appropriate functionality and business process improvements, matching current business processes with provided best practices. Scoping will unearth information about the needs and motivations of stakeholders. It will consolidate the project boundaries and objectives, and allow the mapping of opportunities for improvement. In this objective, scoping workshops will be held with primary and ideally secondary stakeholders. They will be reflected back in a scoping document, which will map the project objectives and recommendations, provide high level plans for content, delivery, timeframes and budget, and can include workflow maps and diagrams when appropriate. Scoping workshops should form the foundation of an implementation project. They provide a structured framework for idea generation and dialogue, create a shared project vision and facilitate exploration of possibilities. It can also be a fantastic team building exercise. Consultants will lead such workshops, in order to bring expertise of the CSR solutions, while facilitating the communication and gently directing discussions and ideas. In preparation or as part of the scoping study, it is recommended to identify all the data sources. This will provide good information on where are some opportunities for improvement, and also to establish the data quality and the need for data cleansing. Step 3 – How to prepare the budget? The process to establish a CSR solution implementation project budget will require careful planning to ensure that the needed information has been gathered and buy-in from significant stakeholders is gained. Very few companies can use a CSR solution right out-of-the-box. The system will most likely need to be tailored to company’s requirements, in order to adapt it to the company’s vocabulary and processes… While companies want to take on board the best practices built-in to the CSR solution, they also want to minimise the changes for themselves, as these changes can prove to be much more costly than adapting the software. How will you know if you have been successful in creating an accurate budget for your project? Internet access (maybe Wi-Fi) for access to files, environments, information, etc. Note that Consultants will usually bring their own laptop to perform their work. Infrastructure or hosting services – different environments will be required, such as Development, Quality-Assurance, UAT, Training, Production, etc. With hardware and network, sometimes purchasing multiple years of maintenance and support will provide savings versus purchasing one year at a time. Ensure your networks are adequate for supporting your implementation and the long-term use of the product. Business SMEs will be required from the start, in order to help document the requirements, during the project in order to respond to questions, make decisions and validate the configuration as it progresses, and to the end in order to perform the User Acceptance Testing. It is important that the configuration is validated along the way, so that discrepancies and defects are found early on, when there is still time and options to address them. Indeed, when problems are found towards the end of the project, the only option left is often to postpone go-live and find space in the budget in order to achieve the desired result, or alternatively to have a second phase. It is usually a good idea to have Business SMEs on the project on a part-time basis, as they inevitably have their own day-to-day work to do. 50% of the time is usually a good ratio, in order to keep them motivated and to the point. You may want to consider backfilling Business SMEs, so the day-to-day work keeps being done, relieving the pressure to perform two jobs at once. The other reason is that if Business SMEs don’t have the time to put into the project, it is a recipe for failure, with no-one available to tell and check what is needed. Don’t forget that company Business Subject Matter Experts (SME) will be required for the length of the project. The budget for this may need to come from the project budget. Should you include a budget for Conferences?… Major CSR software vendors have conferences to help users learn about the product they purchased, to provide information and roadmap about new functionalities and to further people’s expertise in the business domain. 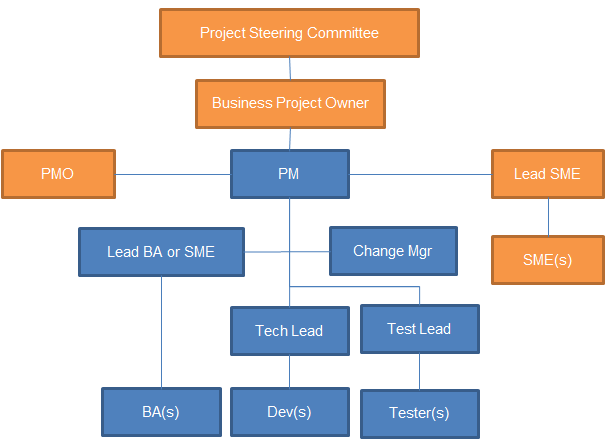 Step 4 – How to prepare for Project Management? There is potentially a lot to say about project management, but the implementation of an enterprise CSR solution should not be different from any other significant or large software development project. As a project Manager, you want to network as a salesman, in order to maximise your chances to get things done. Be an inspirational Leader: minimise management effort, maximise communication, take the time to think and tackle the real problems! It is recommended to implement budget management and audits. Have a nominated Project Sponsor to approve expenditures. Have a Project Steering Committee, usually chaired by the Project Sponsor, in order to follow up on progress against the benefits and make the decisions to steer the project to completion. As the requirements get written, it is very important to establish the traceability between the requirements and the scope. This is in order to monitor the progress against the scope and also to monitor scope creep. During the project, you may want to control hours and rate changes. Determine if Consultants’ rates include travel. Be aware of the common practice of including an annual rate increase. You may want to cap the number of hours consultants can do per week… However this number may need to be revised as the project progresses and deadlines approach. There would be a lot to say about Quality Assurance… It could be a white-paper on its own. In short, testing is extremely important, but is not the only thing to consider. The quality of the requirements is also paramount. The roll-out of the system should not be done during the busiest season and it can be done step by step, for example one function at a time. Consider also the handover to support as part of the roll-out. Step 5 – How to prepare for Benefits Realisation? When the use is established and the system is being properly utilised, the original business objectives should be revised and the measurable objectives should be measured. Measurements may be performed at different time intervals, in order to record evolution over time. It is recommended to establish a baseline, before the system is implemented. A given team’s output measurably increased for using the system… They performed 50% more assessments in the 6 months after the system was rolled-out. The number of grievances being raised or the number of non-compliances is decreasing systematically since using the system. The users’ satisfaction or morale, measured through formal surveys, has increased by 50%. Step 6 – How to prepare for the long-term? Finally, don’t forget that the project may last for a few months only, but the system will likely be in place for 10 years or more. So you may want to build a long-term relationship with the vendor. Some vendors are willing to establish a mutually beneficial partnership type relationship with your company, in order to help you maximise the return on your investment. This might involve attendance to regular meetings at different levels within the company, the establishment of user forums, or the contribution to the product roadmap for example. When reporting on earned value, more often than not, the project is slightly behind the original plan and the earned value is below the planned value. 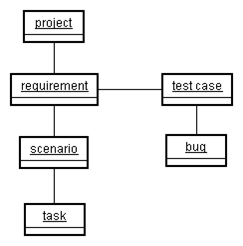 The project critical path can be used, in order to represent the tolerance threshold, as in the example below. How good someone really is, who has never experienced failure, I ask? We all have strengths and weaknesses, and this means we perform better in some situations than others. Have you ever noticed that when their is a problem (and there’s always one), most consider self as being outside of the problem, while everybody else considers you as being part of it? The Team is responsible for developing functionality. Teams are self-managing, self-organising, cross-functional and they are responsible for figuring out how to turn Product Backlog into an increment of functionality. The Scrum Master fills the position normally occupied by the Project Manager. He is responsible for the Scrum process. Like a sheep-dog, he’s responsible for keeping the flock together (focused) and keeping the wolves away (undistracted). A Sprint starts with a planning meeting, where the Product Owner presents the highest priority Product Backlog (4 hours) and the Team plans out the Sprint (another 4 hours). A Sprint finishes with a Sprint review meeting (4 hours), where the team present what was developed. Then the Scrum Master holds a Scrum retrospective meeting with the team. Team Foundation Server (TFS) is a Microsoft offering for source control, data collection, reporting, and project tracking, and is intended for collaborative software development projects. It is not just a bug tracking tool. It is available either as stand-alone software, or as the server side back end platform for Visual Studio Team System (VSTS). Based on MSF Agile, it stretches the Agile approach to comply with CMMI Maturity level 3. It is 150% larger than MSF Agile, for example MSF Agile has 25 work product artefacts, MSF CMMI has 59. Queries and reports can be developed in order to retreive any data from TFS. There are existing reports, such as Bugs rate and Remaining work.SharePoint Web Access allows web access to all the information in TFS: Work items, Queires, Reports, Documents, Source Control, Builds and also Timesheets. 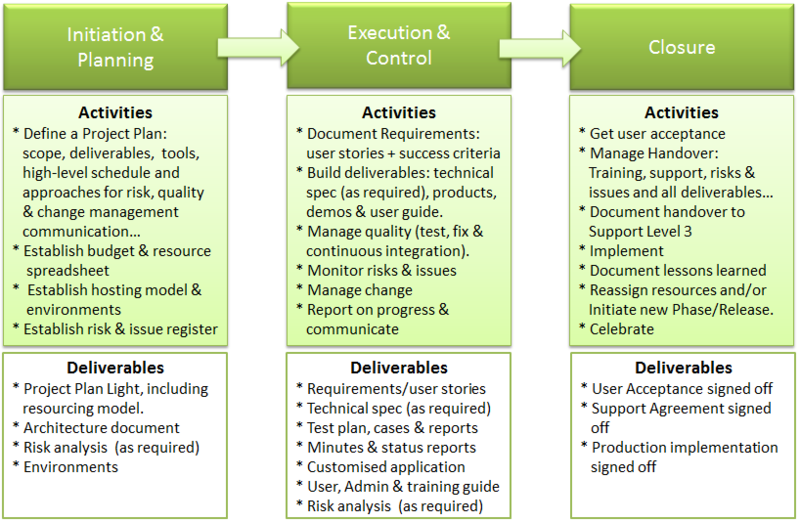 SharePoint can be used by project Stakeholders, including the Customer if you wish. SharePoint Project Portal provides documents repositories for projects and Wiki features. The Integration of TFS and Excel allows to extract any data from TFS into Excel, using queries. The data is copied in the spreadsheet and can be refreshed from TFS at the press of a button. The data can also be edited in Excel and be published in TFS. Charts can then be developed in Excel. It is also possible to develop pivot-table that access the TFS database directly (instead of running a TFS query). Test Director Synchronisation Engine, which allows synchronisation of bugs with the Quality Centre. When it comes to quality in general and code quality in particular, I very much believe in prevention prior to correction. Ensure quality of project processes – implement methodologies for project management and software engineering, such as PMBoK, CMMI, RUP and/or a recognised Agile approach. The time normally spent fixing bugs at the end, is instead spent up-front insuring quality. But then dividends pay in the maintenance phase, where things get much easier. One case study demonstrated that 50% less staff were required in the first 5 years of maintaining a software solution re-engineered using proper design and UML approach. In my point of view, the frequency of total re-engineering needed is also significantly decreased. As a conclusion, in my experience people implementing Agile approaches often tend to dismiss or minimise the preventive activities in the name of agility, while this is not an Agile requirement and it is undesirable for high quality outcomes. In my experience, Risk Analysis is primarily about communication. If the communication going around the project is not open and efficient, no risk analysis approach will save it. On the other hand, if there is good communication going, a simple risk analysis methodology will do wonders. The objective of a risk analysis is to identify, quantify and as much as possible mitigate the effects of events that have the potential to prevent a project from reaching its objectives. A risk analysis is not about identifying dysfunctions or people to blame. A common method consists in brainstorming sessions, which allow to establish a list of risks. Each risk has an assignee, who will have the responsibility to help analysing the risk, usually the subject matter expert. Let’s remind ourselves now one fundamental principle of risk analysis: “No idea is too stupide to be mentionned”. This is why small risks and very important risks will be listed side by side. Then each risk is the object of a detailled analysis, which will allow to determine the value of a number of attributes. In particular, risks are classified by category. Still in the context of the calculation of the importance, it is recommended to undertake a ponderation of the severities in relation to cost, quality and planning, in order to take into account the imperatives of the project. A risk analysis will allow to highlight a number of solutions susceptible to mitigate the risks. Solutions will translate into actions. Some of these actions will need to be undertaken rapidely, in order to prevent the apparition of risks. They are preventive actions. Some will rely on the risk being triggered. They are curative actions. Each action is allocated a value for importance too, which is calculated with the importance of risks it is mitigating. Risks may later be managed using Risk Management Plan type document, or project traking type document, such as Status Assessment. The source of information should also be documented, as context for the risk analysis. For example, list the brainstorming sessions that have happened and the attendees. When documenting the results of the risk analysis, it is recommended to provide first the catalog of risks as a summary, sorted by importance. Then describe the risks in details by category. Proposed actions are listed with a reference, a description, an undertaking mechanism and associated risks (which are mitigated by the action). In conclusion, most of the proposed actions should be preventive and therefore undertaken as soon as possible, as a fundamental principle of risks analysis consists in anticipating problems. Indeed risk analysis is not supposed to provide solutions to existing problems, as it is considered to be late. It is recommended to undertake a process analyse, as per the RUP methodology for example, in order to describe actions in details and to anchor them within a well known methodology. Finally the risks analysis identifies New risks. The risks management consists in turning risks from New to Open when they are triggered, and turning them from Open to Closed when they have been treated. Existing problems, at the time of the risks analysis, aren’t identified as risks, since no probability can associated, but they may be managed as open risks during risk management. Calculate the Earned Value of a project on a weekly basis, using TFS, MSProject and MSExcel. In this article we’ll explain how to calculate an Earned Value in days. It can be calculated in $ in a similar way… It is just a little more complicated. It will work with TFS 2008, Office 2003 and Windows XP. At the time of writing, it won’t work with Office 2007 and Windows Vista. First, the tasks from the work-breakdown-structure are entered in TFS, and assigned to team members as required. A query will be needed to list all the tasks for your project, including the closed ones, so tasks don’t desappear as they get closed. Though it is possible, it is unlikely that all the tasks of a project will be entered in TFS; typically Project Management or certain tasks performed by Consultants, for example. Anyway, I like to have a semi-detailed schedule in MSProject, which will cover for all the tasks in the project. The tasks in TFS may be imported in MSProject automatically, using the TFS client tools, but I personally prefer to do this manually. This is because I might have to prepare a project report as per Friday night on Friday afternoon, and TFS might not always be up-to-date. We have also experienced some problems with this interface. I do however tend to group TFS tasks into a smaller number of tasks in MSProject, especially when there are hundreds or thousands of tasks, in order to make thinks easier. In this objective, the TFS tasks can be imported automatically in an MSExcel sheet (which works much better), using the query we mentioned earlier. Then some calculations can be performed, in order to get Remaining time and %Complete values by group of tasks. 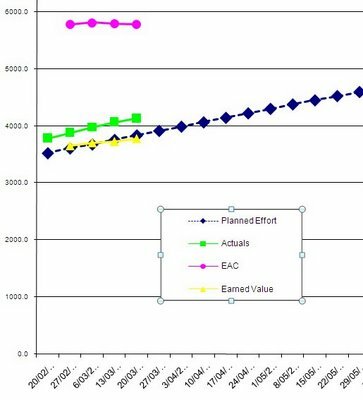 For the Earned Value chart, we need the Planned Effort values. In this objective, we save the schedule baseline using the Resource Usage view in MSProject. Make sure that the values displayed go every 7 days (one week) and then copy and paste them in an MSExcel sheet, and replace the ‘d’ that comes with the numbers by nothing, so they are interpreted as numbers by MSExcel. Now for each column, we need to add the week number, so it can be reference in the Earned Value table, in order to get the Planned Effort for each week. I personally like to use the format “2009w8” for the 8th week of 2009 for example. We also need to calculate the sum of each column and the cumul of the sum for each column. The Developers / Team menbers need to update the tasks that are assigned to them in TFS at least once a week. It is usually convenient to get them to do that at the same time they enter their timesheet. They need to update the Remaining Time and the status of the tasks they’ve been working on. The list of tasks in MSExcel can now be refreshed automatically with the latest values in TFS, and the schedule can be updated (manually), in order to reflect the progress on the project. In theory, TFS Timesheet can update the TFS Tasks Completed Time automatically, but at the time of writting we haven’t been able to get this to work properly. So in order to obtain the actuals, we’ve been able to setup a pivot-table in MSExcel; Setup an external Data-Source pointing to a view, which is refering to the tfstimesheet table in SQL Server on the TFS Server. We just needed the Work Item Id on the left, the sum of hours from timesheet entries in the middle and nothing on top, in order to get only one column with hours. Then a SUMIF formula allowed us to update the Completed time in the tasks listed in a different MSExcel sheet and to publish these values back in TFS. 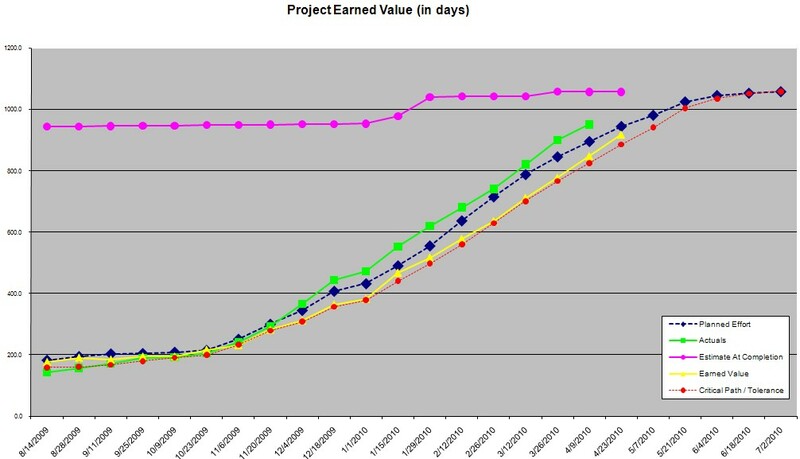 The Estimate At Completion (or EAC) for the project will be provided by the value in the Work column in MSProject. The Earned Value is calculated from the %Complete of the project multiplicated by the baseline budget (in days) or Total Budget in the figure below. The Total Budget is saved every week, because it can change over time, as the project needs to be re-baselined when significant changes happen. 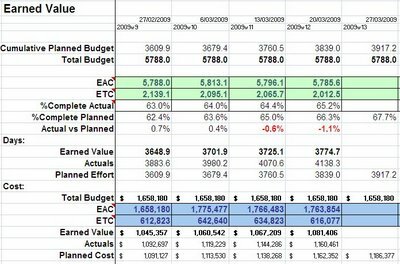 In this case if the history of Total Budget was not saved the values of the Earned Value would be impacted.